The Brass Villanovan Shield is a beautiful recreation of ceremonial shield that was dated back to 7th century B.C. of polished brass. It features an array of attractive and impressive embossed designs. At the center of the shield are a series of concentric circles around a narrow boss, as well as a broad gear-shape with concentric circle patterns set between each spoke. 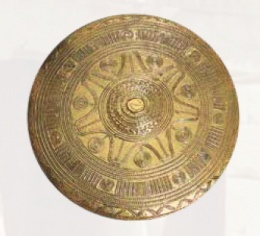 Additional circular patterns decorate the outer edges of the shield, as well as dozens of small, embossed dots that create a visually impressive pattern across the surface of the shield. Etruscan warrior, found near Viterbo, Italy, dated circa 500 BCE. This page was last modified on 23 April 2014, at 19:28.